If you stand on the riverfront at Savannah, Jacksonville or Charleston, or at other ports around the world, you see massive ocean freighters stacked high with colorful boxes. Those boxes are steel containers filled with all manner of freight, going to and from ports around the planet. Before and after their ocean voyages, these containers are mounted on train cars and truck trailers. It is called “intermodal” because the same freight container can transfer between ship, rail and truck without handling of the freight itself when it switches between modes. Intermodal shipping saves tremendously on expense, improves security, reduces damage and loss, and allows freight to be transported faster. What is the story of the evolution of container freight? The idea of containerized freight handling began in the 1700s with tubs of coal on canal barges in England. The concept evolved with railroads and trucking but didn’t really get off the ground until the 20th century. In 1933, the International Chamber of Commerce established The International Container Bureau (Bureau International des Conteneurs, BIC), which set the first standards for freight containers used in international traffic. By the 1950s, standards developed by the US Department of Defense began to revolutionize container shipping. Between 1968 and 1970, the International Organization for Standardization (ISO) issued standards based upon American military practices. 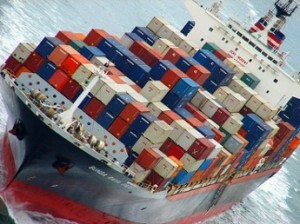 Since 1980, the use of 20 foot and 40 foot freight containers has come to dominate worldwide shipping. Every time I drive down I-75 from Atlanta to Macon and then I-16 to Savannah, I see at least a hundred intermodal container freight tractor-trailer units sharing the highway with me. On I-95 between the Florida and South Carolina lines, it is pretty much the same. When I look down from my office window in Atlanta, I often see freight containers double-stacked on rail cars on the track that runs parallel to the MARTA line across the street. With the expansion of the Port of Savannah, we will see more and more container freight in Georgia. 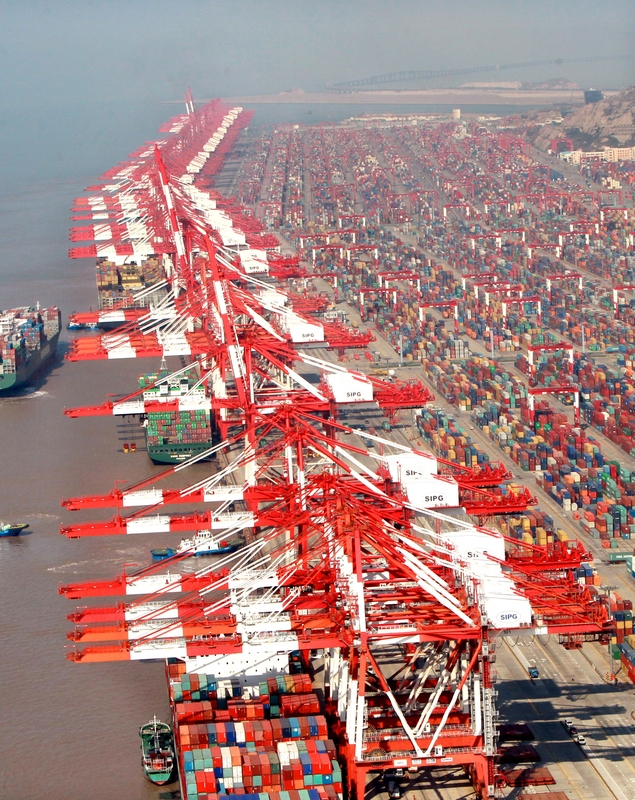 What are the top container freight ports? 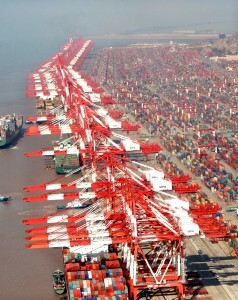 Of the top 20 container freight ports in the world, 8 are in China. The others are at Singapore, Hong Kong, South Korea, Dubai, Netherlands (Rotterdam), Malaysia, Taiwan, Germany (Hamburg), Belgium (Antwerp), and the US (Los Angeles and Long Beach). Savannah ranks #46 in the world. It is about to get a lot busier with enlargement of the Panama Canal and port expansion on which dredging work has begun. Savannah has a favored location because of a sophisticated analysis of efficient road and railway access to the South and Midwest. It contributed to the role of Georgia and Atlanta as a commercial hub. For that reason, expansion of the Port of Savannah has been a huge public policy priority for the Governor of Georgia, Mayor of Atlanta, and a broad range of other political and business leaders in Georgia. Charleston ranks #82 in the world. Jacksonville, which handles freight traffic to Puerto Rico and the Caribbean, is not in the top 100 but it still contributes a lot of container truck traffic to I-95 in Georgia. Other busy container ports in the US include NY/NJ (#26), Oakland (#62), Newport News (#64), Houston (#74), Tacoma(#78) and Seattle (#83). Who are the truckers towing intermodal container freight trailers? When intermodal freight containers are put on trucks for the land portion of the shipment, the trucking company used is likely to be a small one with few assets, 20 to 50 leased tractors and a single-limit $1 million liability insurance policy. The drivers for those companies are typically pushed hard with inadequate pay and inadequate rest. There may be a convoluted transaction involving a logistics company, a freight forwarder, non-vessel operating common carrier, ocean transportation intermediary or a freight broker, seeking to provide layers of insulation between the most responsible entities and the little trucking company and driver. That is intended to insource the profits and outsource the risk, creating a barrier to financial accountability on the part of the larger companies that pull the strings. When there is a catastrophic crash involving an intermodal tractor-trailer unit, the insurer for the tiny trucking company often goes to the survivors of however many people were killed and offers to split that one million dollar policy. If, for example, five people were killed, they will offer to give each of the families $200,000 each if they all sign full releases. If there were three deaths and a bunch of serious injuries, they might invite everyone to go to a mediation to decide how to split that million dollars. They swear that is all the insurance there is or will ever be. Perhaps the lawyers and claims adjusters at that level really believe what they are saying. Perhaps they have been given the “mushroom treatment” – kept in the dark and fed manure. But there is a lot more if you know how to get it. How can I recognize that a tractor-trailer was carrying an intermodal shipping container? On first glance, most intermodal tractor-trailer units look a lot like any other tractor-trailer. But if you know what to look for, you can tell the difference. First, what are the name markings on the body of the trailer? If the trailer body is a freight container bolted to a trailer chassis, it probably bears the name of an intermodal shipping company. Those we see on the interstate highways in Georgia operating from the Port of Savannah include: Moller-Maersk (also Maersk Sealand), CMA CGM, COSCO, Hapag-Lloyd, Evergreen, APL, CSCL, Hanjin Shipping, NYK Line, Hamburg Sud, “K” Line, Yang Ming, Hyundai, ZIM, United Arab Shipping Co. (UASC), CSAV. 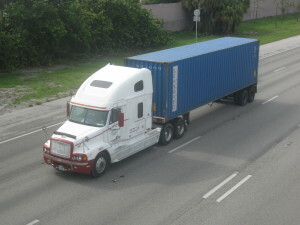 There are also other intermodal shipping companies operating in the Caribbean trade out of the Port of Jacksonville that send a steady flow of containers mounted on trucks up I-95 through Georgia. Second, what are the markings on the rear doors of the trailer? 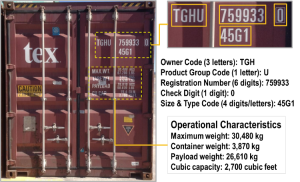 Intermodal freight containers include a 3-letter owner code, a one-letter product group code, 6 digit registration number, 1 digit “check digit”, 4 digit size and type code. Below that are the maximum weight, container or “tare” weight, payload weight (all expressed in both kilograms and pounds), and the cubic capacity expressed in both cubic meters and cubic feet. Third, what are the numbers on the trailer frame below the doors and above the tag, and on the side of the center frame rail of the trailer? If it is an intermodal tractor-trailer unit, the Federal Motor Carrier Safety Administration requires display of a USDOT registration number on the trailer chassis above the rear tag. It includes a four-letter code to indicate the registered owner, a six-digit registration number and one-digit “check digit.” With that we can figure out what company initially registered that trailer chassis. None of this information appears on standard police crash report forms. Most law enforcement agencies simply don’t know to look for it. They will record information about the trucking company but none of the information about the trailer. In addition to standard rectangular containers for general freight, we often see refrigerated (“reefer”) or insulated containers, open top bulk containers, flat racks used to transport machinery, and tank containers with cylindrical vessels mounted in a rectangular steel framework. They bear similar markings. What difference does it make to injury victims if a tractor-trailer unit included an intermodal container chassis trailer? There are no published court decisions on this. Perhaps there never will be as serious claims tend to be settled confidentially before any court decision. However, we have had success in combining federal motor carrier regulations, federal maritime regulations, ocean bills of lading and international maritime treaties to reach insurance coverage far greater than a single limit one million policy typically carried by a small trucking company. My friend and colleague, David Nissenberg in California, author of The Law of Commercial Trucking: Damages to Persons and Property, has been invaluable in figuring this out. We have found that if we do it right, we can gain access to enough additional insurance to obtain a fair but confidential settlement of almost any cases that may arise with intermodal freight shipments on the highways of Georgia. Due to settlement terms, I am not liberty to reveal anything about any of the intermodal cases we have handled. I am not publishing the legal theories we use or posting copies of briefs and legal memoranda online. That is for the same reason that I did not publish an article or give seminar presentations years ago when I figured out that by classifying a forklift truck as an office supply I could bring a wrongful death suit against an equipment distributor under the Georgia Fair Business Practices Act, which provides for treble damages, punitive damages and award of attorney fees. I knew then, and know now, that if I freely shared my work product, some lawyer who has not studied it in depth would try to use it without studying the foundations in depth, lose, and mess it up for everyone else. What if an intermodal truck crash happened in a state other than Georgia? Intermodal freight has worldwide scope. Our practice is primarily in Georgia. But that does not mean we are limited to handling cases arising from intermodal truck crashes in Georgia. Most major ocean carriers and intermodal equipment providers do business in Georgia through the booming Port of Savannah. If an incident has a Georgia nexus, we may be able to handle the case in Georgia. Every question of jurisdiction and venue require a fact-sensitive analysis of details. But, for example, any Georgia resident injured in a crash occurring anywhere in the country may file suit here so long as the rig is on an interstate trip and the trucking company has registered an agent for service of process covering Georgia. We cannot promise an outcome in any case. Each of these cases is different. While there are points of commonality, the facts of each case are different and the specific combination of legal theories may be different. One size does not fit all. If a loved one was catastrophically injured or killed due to a collision with a tractor-trailer in which the trailer was an intermodal container chassis with freight container mounted on it, call us. Ken Shigley is an Atlanta trial attorney focused on serious personal injury and wrongful death cases. He is currently chair of the American Association for Justice Motor Vehicle Collision, Highway & Premises Liability Section. Previously he served as president of the State Bar of Georgia and chair of the board of trustees of theInstitute for Continuing Legal Education in Georgia. He is lead author of Georgia Law of Torts: Trial Preparation and Practice and a board certified civil trial attorney of the National Board of Trial Advocacy.